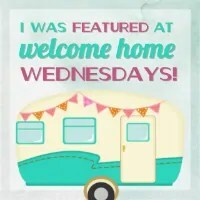 Yay, Welcome to Welcome Home Wednesdays #34!!! Spring Break is over and the kids are back in school, so it’s nice to have a routine again. The weather has been spring-like here in the NW, which is making life good 🙂 I made this wonderful Lavender Vanilla Sugar Scrub this past week, so my rough heels and toes should be soft and smooth come summer time! Thanks for coming by and linking up, Kim! Have a great week! Hi Joanna! Nice to see you here! Thanks for coming by and linking! Of course. You did a wonderful job! So creative! Thanks Erin for the lovely party dear, and for giving us chance to share our recipes. Thanks for coming by every week, Sadhna! You have the best authentic recipes! So excited to have my 3-tier shelf and mason jar featured! Thanks so much ladies! You’re one crafty lady! Thanks for linking up with us! Thanks for popping by, Katrin! Happy to have you, Stacey. See you next week! Hi Erin! Thanks so much to you and the ladies for hosting – hope you’re having a fabulous week! The week has been great, Cindy! Thanks for coming by and partying with us! Happy Wednesday Erin! Thanks for co-hosting and looking forward to seeing you next week. You’re sweet for coming by and leaving a lovely comment each week, Lynn. Thank you. Thank you, Kathryn! Love seeing you here! Thank you for coming by, Marilyn! Thanks also for the reminder about your parties! Thanks so much for coming by, Dee! So glad you did!